Vanilla Bean Noel will fill your heart with laughter with the scent of fresh vanilla bean, warm caramel & sugar cookies. You receive TWO (2) Foaming Hand Soaps -- 8.75 fl oz each. Fill your heart with laughter with the scent of fresh vanilla bean, warm caramel & sugar cookies. You receive TWO (2) Foaming Hand Soaps -- 8.75 fl oz each. 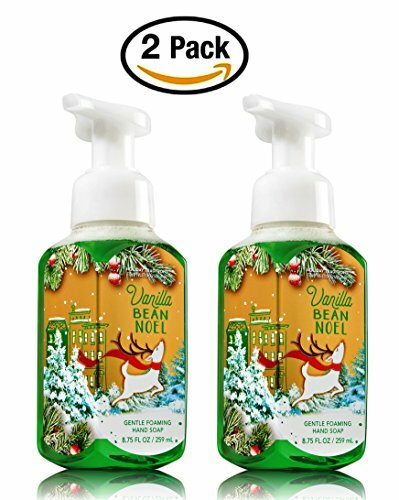 The new, premium formula in this Vanilla Bean Noel Foaming Hand Soap delivers a cloud of luxurious foam that transforms into a rich, creamy lather to gently wash away dirt and germs, while soothing Aloe and nourishing Vitamin E leave hands feeling soft, smooth and lightly scented. Seasonally Discontinued Bath & Body Works scent - available for a limited time only.